ST. LOUIS, MO--(Marketwired - Apr 22, 2015) - Renaissance St. Louis Airport Hotel is proud to host The Young Artists of St. Louis Gallery Opening. The gallery event, displaying student artwork, will be held April 27th from 6:00pm-8:00pm at the Renaissance St. Louis Airport Hotel. Renaissance St. Louis Airport has partnered with Holman Elementary, part of the Ferguson-Florissant School District, to launch the community oriented art exhibit. Using mediums such as water color, pencil, crayon and oil pastel, the students were asked to create pieces showcasing their favorite St. Louis attraction, location or landmark. The Gallery viewing will be held in the Lobby Level adjacent to the Front Desk and will include refreshments and snacks for guests. The project couples Social Studies with the Arts which allows students to learn about important landmarks in the city while being creative and utilizing elements of art. "Partnering with businesses in the community is a great way to highlight our unbelievably talented students and that Holman Elementary School is truly a wonderful place to grow and learn," said Jamie Otto, Principal at Holman Elementary. Renaissance St. Louis Airport Hotel offers luxury, comfort and connectivity to the finest in St. Louis attractions with 374 guest rooms and 19 suites, as well as 37,000 sq. ft. of meeting space. The hotel is just minutes away from popular attractions like the Saint Louis Arch, while corporate travelers enjoy our St. Louis business hotel's amenities & proximity to downtown and the Lambert-St. Louis International Airport. 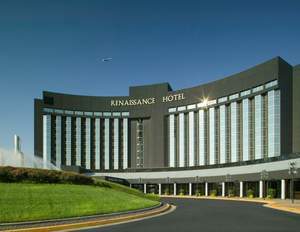 Renaissance St. Louis Airport Hotel is managed by Schulte Hospitality Group. Schulte Hospitality Group (SHG) is a full service hospitality company specializing in full service hospitality management and consulting services. With over 46 hotels throughout the United States, Schulte Hospitality has become one of the fastest growing hotel management companies of its kind. The company manages Full Service as well as select and limited service hotels and resorts under various brands including Marriott, Hilton and Intercontinental Hotels Group (IHG). See more at www.schultehotels.com. Renaissance St. Louis Airport has partnered with Holman Elementary, part of the Ferguson-Florissant School District, to launch the community oriented art exhibit.